Thornell Skunk-Off Pet Shampoo 8oz removes all traces of skunk spray from dogs, other pets, people, cloths, cars, homes - anybody or anything a skunk has sprayed or anything a skunk-sprayed animal has rubbed against. 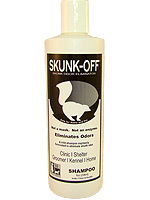 Stops skunk odor instantly and permanently on contact. Removes all traces of skunk spray from dogs, other pets, people, cloths, cars, homes – anybody or anything a skunk has sprayed or anything a skunk-sprayed animal has rubbed against. Safe for use on all surfaces – carpet, upholstery and directly on the pet. Liquid is applied full strength as a spray or soaker from the easy-to-use 8 oz. squeeze bottle. Shampoo is thoroughly applied to the entire animal and then rinsed. Wipe off excess skunk spray in areas of direct hit. If using the Skunk Off liquid saturate the area of the direct hit. Work in thoroughly if on fur or clothing, then let dry. If using Skunk Off Shampoo apply liberal amounts to the affected area, let stand for 3-5 minutes and then rinse. If pre-treatment has occurred (tomato juice, shampooing,) dissolve one full bottle of the 8 oz. liquid SKUNK-OFF in two quarts of warm water and completely saturate the animal or article (caution should be used to protect pet's eyes). If any skunk odor remains SKUNK-OFF has not come in contact with some of the skunk spray. Locate the missed spot(s) and re-apply.